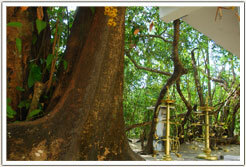 According to mythology, a yogi walking on the bank of river happens to see a banyan tree and having understood its importance took shelter under the tree. There he witnessed a ‘divine light’ and continued his meditation in the company of divine snakes. The branches on which the Nagas that had accompanied the yogi twined and the hole, in which they lived, later came to be known as ‘Pambadiyal’. There is a legendry belief regarding the presence of a small pool inside the four walls which is believed to be used by the yogi. There is another legacy regarding the origin of the kshetra. In ancient period two goddess who were sisters came to Earth. Elder one traveled through river and the youngest one through mountain ranges. They met after crossing the Valapattanam backwaters. The younger sister who was tired and thirsty after a long journey was about to drink water from a well, but was warned by the elder sister, as the well was situated near a cemetery. Giving no ears to the elder sister’s warning, younger sister drank water from the well and was abandoned by the elder sister by giving a promise that they shall meet every year. Thereafter rested at the place where the yogi was kept Samadhi. There still exist the custom of the ‘Putiya Bagavathi’ with fire balls running to the east to meet the younger sister and then returning back. The place where the younger sister got impure was gradually taken over by the Muslim community where in they built mosque which is now known as ‘Alalam Mosque’. This place is thickly populated with banyan trees and snakes. Even today ‘Ney-Vilak’ is lighted there. ‘Alalam mosque’ still continues the custom of preparing ‘Chakkarakanji’ with rice, coconut and jaggery given by Pambadiyal on the last day of the ‘Theyyamthira’. The place which was possessed by Chirakkal Thamburan was once under ‘Kuvan Tharavad.’ Maheswaran Kannan, land lord of that time protected the kshetra by construction walls and there were stone pillars with lamps which were lighted every evening. Even now it is repeated in the early morning. Almost 100 years ago the responsibility of the Kshetra was given to ‘Kayakath Valapil’ Tharavad along with Maheswaran, and Kuvan tharavad. Later ‘Thayyam thira’, was conducted by the ‘Ulsava committee’ where the people of that locality were the main members. Every day lamp was lighted and poojas were performed by descendants of Maheswaran Kannan. After the death of Maheswaran kannan, he was solemnized as ‘Guru’ in Tharavad and Guru pooja was performed. During earlier days Theyyam appears in the form of Puthiya Bagavathy, Veerali, Veeran, and later was Nagakanya, Vishnu moorthy. 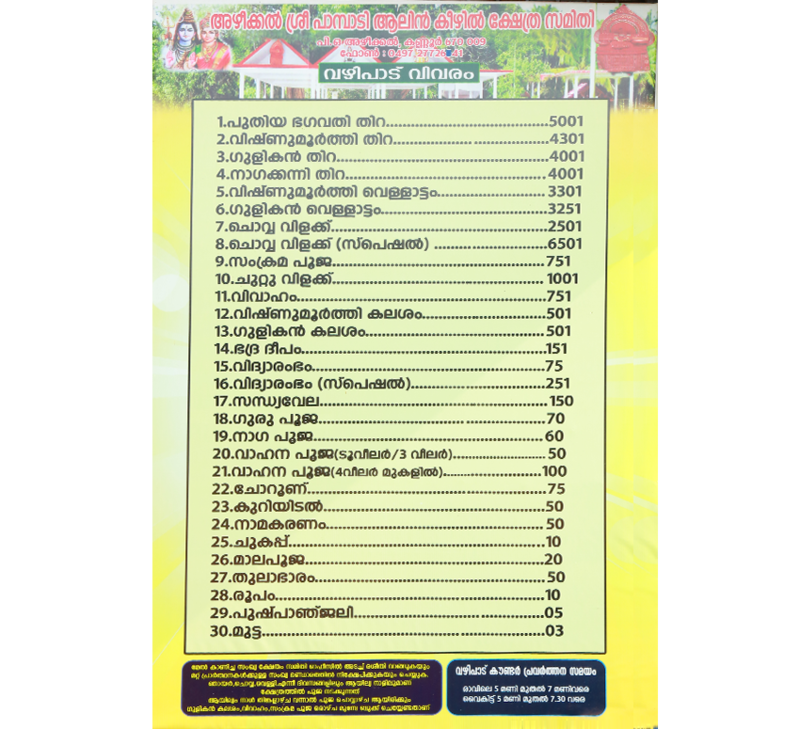 Earlier only ‘Sandhyadeepam’ & ‘Sandhyavela’ were offered. In the past, Maheswaran Kelam used to offer the Gurupooja and Nagapooja. He used to conduct these poojas to get rid of the ill effects caused by the dissatisfaction of the Nagas. The ‘Kalasha’ water was used to do the remedial poojas. It was during his era that most of the developments were carried out. 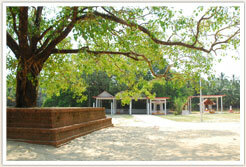 Many buildings, Prathishthas & kovil were constructed. The most important offerings made in the Kshetra are offering milk and egg for the Nagas, Gurupooja, Nagapooja & lighting lamps around the Kshetra on Tuesdays, Fridays and Sundays. Special Nagapooja is carried out on Ayilyam day. Moreover offerings in the form of coconut oil, oil lamps and red silk cloth. Special poojas are carried out daily according to the demands of the devotees. Every month on Sankrama day ‘Sankram pooja’ is also held. Even though it’s a Thiyya based Kshetra, irrespective of caste & creed every devotee visit the kshetra & offer their pray. The Naga appears in case of any of the kshetra rituals are violated. If so remedial prayers or offerings are carried out as suggested by the astrologer. Conflicts between people are settled in presence of kshetra committee. Even court had permitted the kshetra to interfere in dispute and take a decision. The main occasion of the kshetra is the ‘Puthari’ function (an harvest function) which is conducted before “Dhanu 10th”. This is a function where most of the people around the kshetra premises, cooks rice in a new pot either with coconut, jaggery & banana or with coconut alone. The mouth of the pot is then scaled with banana leaf & kept in front of kshetra for doing the pooja. 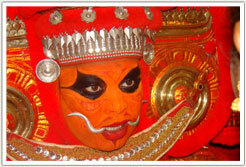 The ‘Theyyam’ occasion is conducted within the 30th of ‘Makara’. Earlier this function was conducted for 2 days only. But today it’s been celebrated for 5 days. On the ‘Thira’ day the ‘Velichapadu’ visits every house. It’s necessary that all houses & its premises have to be kept neat & tidy before the Velichapadu comes. The head of the family receive and greet Velichapadu in the traditional form by washing his feet and by lighting the lamp (Vilakku). He then showers blessings to all inmates and offers “manjal kuri”. During the five days various cultural programs are conducted by various artists.